Also known as Dishwasher Deathmatch Round 3. Or Round 4? I’ve lost count. Another fresh-out-of-warranty dishwasher, another malfunction. At least this one didn’t destroy my kitchen. The good news is my credit card covers the extended warranty. I hadn’t even thought to check on that, but a friend suggestion I look into it. Clever! So now to schedule the fixing of the dish washing machine that keeps this mermaid’s hands dry… wait, that’s not right. 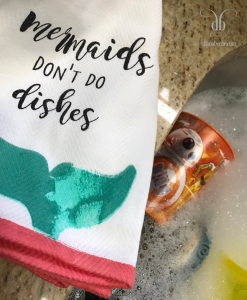 Well, until then, this mermaid must do dishes. I think these adorable dish towels will help. Don’t you?